The consequences of the Uprising in India and internationally including impact on British attitudes and methods of rule. The events of 1857 have been one of the most written about episodes in the history of British rule in India. Unsurprisingly views about how to explain the violence and the cause of the unrest have changed over time, reflecting larger debates about the nature of imperialism itself. This section provides a broad outline to explain how those views have developed over time. In India, colonial officials were quick to see the rebellion as a ‘Muslim’ conspiracy against British rule. They saw those Indians involved in the violence to be doing so at the whim of Muslim elites, even though many of these elites were not themselves involved in the violence. Bahadur Shah Zafar, the Mughal Emperor in name only who was 82 years old at the time of the rebellion, was exiled to Burma, which the British also controlled at this time. In Delhi, government forces attacked and drove out all Muslim residents from the city, regardless of their involvement in the unrest. Read the story of Bahadur Shah Zafar, the last Mughal Emperor, and the event in 1857, in William Dalrymple's non-fiction book The LastMughal: The Fall of Delhi, 1857. Disraeli's speeches in 1857 (Hansard), on several occasions there were lengthy Q&As about the situation in India (Disraeli, Palmerston and others). A sample of the initial coverage in this Guardian archival piece: June 1857: The Indian Mutiny. An article on British Press and the Indian Mutiny. The events also attracted huge attention in Britain, both amongst politicians and, through extensive newspaper coverage, the British public. Some public figures, including Benjamin Disraeli, argued that the expansionist policies of the colonial administration, under the control of the East India Company, was itself partly to blame for the unrest. Press reportage of the rebellion, however, leant towards a different kind of view – that the rebellion was an inversion of the ‘proper’ racial order. Gory coverage of the violence depicted the rebels as ‘barbarians’ who massacred innocent civilians, particularly women and children. Many of the women and children caught up in the violence were Anglo-Indian, born to British fathers and Indian or mixed-race mothers. This was not mentioned in the press coverage, however, which viewed the violence in deeply racialised terms, as an attack by uncivilised Indians against representatives of a more advanced but fundamentally benevolent white society. These debates played an important role in shaping the ideas and expectations around which future histories of the event were written and received. John Kaye's and Malleson's History of the Indian Mutiny of 1857-8 (6 vols), 1888-9. William Muir kept an Agra Correspondence During the Mutiny (published in 1898). Muir also contributed to the 2-volume Records of the Intelligence Department of the Government of the Northwest Provinces of India (published in 1902), with details on Agra in the mutiny in vol. 1. George Otto Trevelyan, Cawnpore (first published in 1865). Many of the first ‘histories’ of 1857 were written by men who had served in the colonial administration, either before the rebellion (John Kaye and William Muir) or afterwards (George Trevelyan). These works focused heavily on the role of the imperial army – the sepoys – in the unrest and foregrounded the role of rumours about the use of animal fat to grease gun cartridges to explain as the immediate cause of the unrest. While ideas of Indian barbarism permeated these arguments, these authors also criticised the expansionist policies of the Company government for pushing otherwise loyal soldiers too far. These histories both explained what had happened in 1857 but also sought to justify the continuation of British rule in India, under Crown control. In condemning Company policies, these books also worked implicitly to endorse the policies of the Crown-controlled imperial government which pledged not to expand its borders further or to interfere in the religious practices of its Indian subjects. From his residence in London Karl Marx had also followed the news coverage of Indian events with great interest. Together with Fredrich Engels, he wrote a number of pieces for the New York Daily Tribune, about his view and interpretation of the unrest. Marx argued that the violence was a ‘national revolt’. He was clear that this was no revolt by the proletariat – rather he likened it to the more ‘bourgeois’ character of the French revolution. It was not until the early twentieth-century, however, that the rebellion came to be taken up in explicitly national terms. In 1909 V.D. Savarkar, who urged Indians to take up arms against British imperialism, published his analysis of the events of 1857 as The Indian War of Independence. The basic narrative of this account had more in common with those of Kaye and Muir than with Marx’s writings. Savarkar saw the sepoys as the primary agents of the unrest, who tried to lead a passive and dormant nation to their freedom. Subsequent nationalist works, published around the middle of the twentieth century looked more explicitly to Marx’s argument to analyse 1857 in terms of a clash between feudalism and capitalism (see for example the work of R.P Dutt, R.C. Majumdar and P.C. Joshi). These works prompted Indian historians to analyse the class and social differences between the Indian groups that were involved in the unrest in a manner that was not possible in Savarkar’s more monochrome analysis of national vs. imperial interests. Marx and Engels' pieces for the New York Daily Tribune. V.D.Savarkar, The Indian War of Independence of 1857 (1909). ​Ranajit Guha (ed. ), Subaltern Studies IV: Writings on South Asian History and Society (1985). Eric Stokes, The Peasants Armed: the Indian Revolt of 1857 (1986). Ranajit Guha, Dominance without Hegemony: History and Power in Colonial India (1998). Dipesh Chakrabarty, ‘Subaltern Studies and postcolonial historiography’, Nepantla, Vol. 1, issue 1 (2000) pp. 9-32. Watch this 2013 Youtube video of panel discussion on Ranjit Guha and the subaltern studies, with panelists Shahid Amin, Dipesh Chakrabarty, Gyanendra Pandey and Gayatri Chakravorty Spivak. This is a terrific website of primary source materials that can be utilised. This also includes links to local archives that might be interested in developing projects with schools related to papers they have in their archives on the Rebellion (‘Mutiny’). In the 1970s, Marxist analysis of the 1857 rebellion came to be folded into an emerging new field of scholarship – peasant studies – which analysed politics in the developing world through a focus on agrarian relations. Eric Stokes, Ranajit Guha and Gautam Bhadra were leading scholars in this development. In the South Asian context, the study of peasant ‘revolt’ became the major framework through which scholars began to question who had been the traditional ‘subjects’ of Indian history and to put forward a new agenda to study not elites but figures that Guha and his colleagues described as ‘subalterns’. Alongside broader developments in social and feminist history, South Asian historians became interested in looking at traditionally marginalised social groups – particularly women and Dalit (untouchable) communities. This has been important for scholarship on 1857 as it has drawn attention to the fact that different groups and individuals joined the unrest for different kinds of reasons. These studies seek to understand how and why these diverse groups came together in the unrest of this period, and why we have tended to read their actions as reflecting a more uniform group than is in fact the case. The Mutiny at the Margins project is a great example of this scholarship. James Baillie Fraser, View of Esplanade Row, from the Chouringhee Road, 1826. 13690 (SOAS art account number), SOAS Library. BBC. British India and the 'Great Rebellion'. The british impact on india, 1700-1900 (Education About Asia, AAS). Digital Archives: Teaching Indian Colonial History Through Photographs​ (Education About Asia, AAS)​. (Secondary) Teaching Empire (History Association). (K3) About 1857 Indian Rebellion​ (History Association). A teacher's notes on How can we explain why so many Indian people decided to fight against the British in 1857? (National Archives). 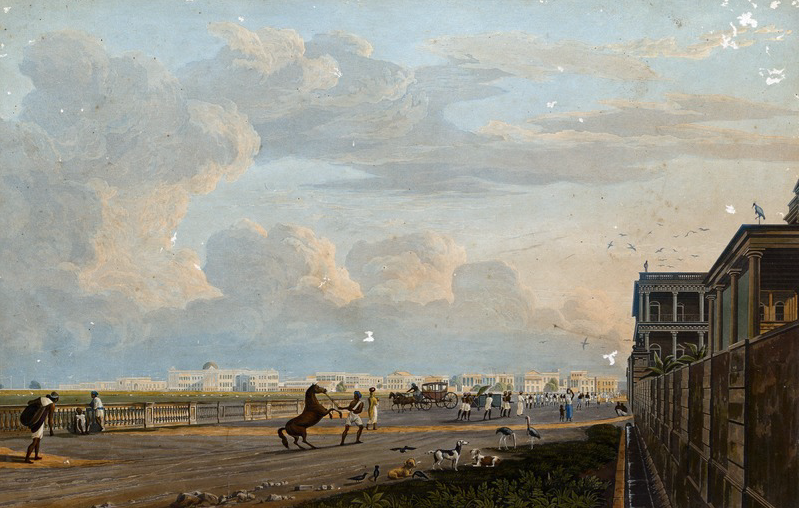 ​Header image: James Baillie Fraser, View of Esplanade Row, from the Chouringhee Road, 1826. 13690 (SOAS art account number), SOAS Library.